Happy Heart Month! Aside from searching for the perfect Valentine goodies for your sweetie and doodling hearts everywhere, February is a great month to evaluate how things are going with your health, especially your heart. Are we headed towards our health resolutions we may have set last month? How’s the diet been these days? Is it heart-friendly? Are we stressed? Overly-busy? Are we being nice to ourselves and doing something our heart enjoys once in a while? Are we making enough time for ourselves? Time. Definitely a precious commodity, as well as a luxury that we so often feel we do not have. If I had more time, I could cook healthier. If I had more time, I could work out more. If I had more time, I could get more sleep! Ladies and gents, I hear ya. I feel this way so much of the….well….time. While I may not be able to help you get more sleep, or strap you inside a hamster wheel for more exercise, providing quick and healthy meal ideas is where I CAN help. 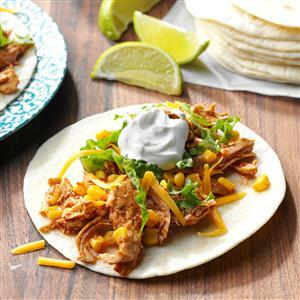 Just try out this ridiculously easy, delicious, and HEART-HEALTHY recipe for Lime Chicken Tacos. And when I mean ridiculously easy, I mean RIDICULOUS. It’s almost too easy for it to still taste that good, it’s almost like cheating. All you need is a few ingredients and a crock-pot, and let precious time do the rest. On days I want to throw in the towel but do NOT want to resort to take-out for my family, this is one of my go-to’s. You pretty much throw it in a crock-pot (at least a 3 quart pot) and forget about it for 5 hours. In the meantime, your home is consumed with that delicious citrus aroma. 2) Sprinkle chili powder and lime juice over the top. 3) Cover and cook on low, forget about it for 5 hours. 7) You’re done. Serve on warm tortillas with the extras as your heart desires. That’s it people. So easy. So tasty. So little mess (unless I am your cook). It makes a bunch too, the original recipe says for 12 people. That being the case, it is also great for left-overs, especially as a taco-salad topper. – ANOTHER TIME SAVER :O ! Remember also, I am a registered dietitian providing nutritional counseling and education to the New Braunfels-San Antonio-San Marcos areas. If you need more help with your diet, please give me a shout or check out www.food4success.com . I will also be having a class: Carb Counting Made Easy on Thursday, March 3 at 6:30pm at my office. Just contact me to sign up or if you are needing more information. Enjoy! Let me know how this recipe works out for you! Until next time….